Viva Vision Light shows last approximately six minutes, and run every hour. The current time schedule is 6:00 p.m., 7:00 p.m., 8:00 p.m., 9:00 p.m., 10:00 p.m., 11:00 p.m., 12:00 a.m., 1:00 a.m. Start and end times vary based upon the season. 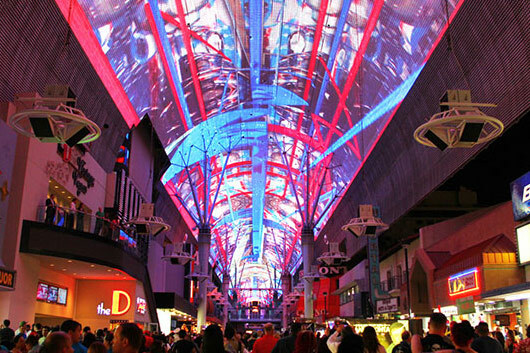 The Viva Vision Light Show video screen is 1,500 feet long, 90 feet wide and suspended 90 feet above Fremont Street’s renowned pedestrian mall, lined by iconic casinos and hotels. Viva Vision light shows feature music from The Killers, Linkin Park, Green Day, Imagine Dragons, The Who and Tiesto. Check the monthly calendar to see which Viva Vision show plays when.